The Old Cow Stall is a new extension off of the side of our family home. Pound Barn was originally the old hay barn of Woolgarston Farm, with The Cow Stall just to the side where the calves were kept and fed. 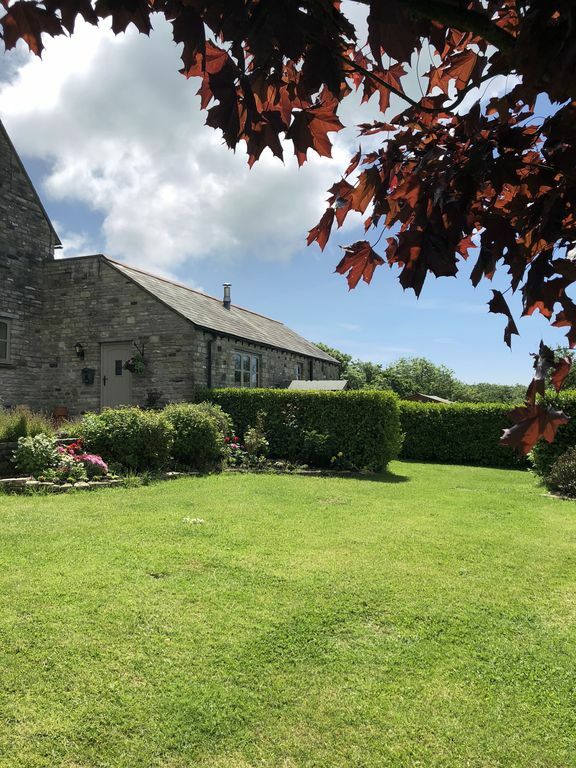 An open plan layout with beautiful views of the surrounding countryside, The Cow Stall has private parking and a secluded garden with a lockable shed, patio seating area and BBQ. This location is one of the most peaceful and tranquil in Purbeck. In the daytime you will be serenaded by the birds whilst watching our thriving local wildlife. In the evening you can watch the most stunning sunsets followed by the starry nights sky. The property is situated within walking distance of the village of Corfe Castle. The villages main attractions are include the castle ruins, steam train, cafes, gift shops, local bakery and small grocers store. The seaside town of Swanage and other fantastic local beaches including Studland and Kimmeridge are all less than a 10 minute drive away. Central heating throughout, can easily be controlled by thermostat on wall by bathroom, will be shown how to use. Villager woodburner, enough wood is provided for one nights burning in winter months, the rest can be purchased from local store if needed. An away from it all location yet still close enough to local villages, small towns and beaches. Perfect for those who enjoy walking, cycling, bird and nature watching or anyone who wants a relaxing peaceful and quiet break. We are very sorry this is a non-smoking property. We are unable to accommodate pets and children. Well kitted out, thoroughly modern and a good size for two people. Great location for walking the Isle.... we didn’t need to use the car and proximity to the train station is a real bonus. This barn conversion (or cowstall conversion, I think, to be totally accurate) looks newly done. It's well equipped, with a dishwasher in the kitchen, a very good shower room, and a generously sized bedroom and bed. The living area has a woodburning stove - not strictly necessary as there is also very efficient central heating, but always welcome if you're staying in winter (or one of those chilly wet spells in other seasons) and want to feel cosy. The garden is lovely, even in November, and must be wonderful in the summer. The views are amazing and it's in a great location, very quiet but an easy drive to anywhere on the Isle of Purbeck. There are a couple of doors in the cottage that lead directly into the owners' house or garden which for some people might reduce the sense of privacy, but it wasn't a problem for us. Our only niggle was the seating provision in the living room - a small sofa which does seat two people, but only if you sit neatly upright side by side, so there's no lounging in front of the tv here! In the summer though that probably wouldn't matter as you'd want to be outside enjoying the garden. Sarah und Julian sind sehr nette und hilfsbereite Gastgeber, die einem Ruhe und Privatsphäre lassen oder sich Zeit nehmen, um über alles mögliche zu reden, je nachdem wie man es mag. Das Cottage ist von Julian perfekt neu aus- und umgebaut worden. Es ist geschmackvoll eingerichtet und vollständig ausgestattet, inklusive Gartenstühlen, Sonnenschirm, Grill usw. Der "eigene" Garten und der fantastische Blick ins Purbeck-Tal, sowie die Lage Abseits der Hauptstraße finden meine Frau und ich perfekt!